Atop robust double pedestals, let our handcrafted Lowell Double Pedestal Table serve your entertaining needs with optional, self-storing table leaves. Before an Amish artisan stains your Lowell Double Pedestal Table to a glossy finish, he sands it by hand to a smooth perfection and stains it to your specifications. Solid wood construction means that our kitchen and dining tables are free of plywood, fillers, and veneers. The totality of your Lowell Double Pedestal Table is made exclusively of the hardwood you select. Do you prefer the look as shown? Choose Quartersawn White Oak with a Burnished Honey wood finish. Available in six sizes, both solid top and multiple leaf options are available in this classic piece which boasts a solid one inch thick table top. Expanding slides are geared and up to four leaves can be stored within the table itself, even when not in use. 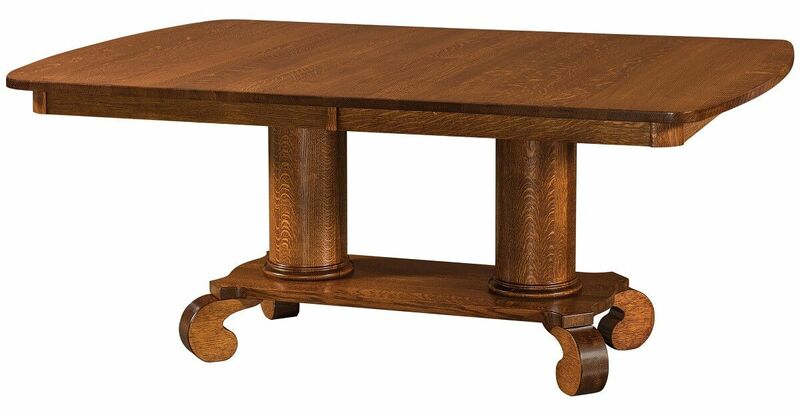 The base of this discerning Amish double pedestal dining table features an adjuster in each foot to keep your Lowel on the level. Choose your hardwood, stain, and size to create a solid wood heirloom as unique as your family. **Floor to apron clearance is 26 1/2".